Hellboy is a 2019 USA action Sci-Fi fantasy by Neil Marshall. Starring Daniel Dae Kim, Milla Jovovich and David Harbour. 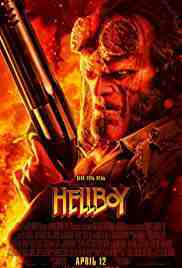 In the UK the BBFC have passed the 2019 remake of Hellboy as 15 uncut for strong bloody violence, gore, language. In Ireland the cinema release is 16 rated by IFCO for very strong bloody violence. In the US the film was MPAA R rated for strong bloody violence and gore throughout, and language. The film censors of the Australian Classification Board rated the film as R18+ (18 in UK terms) for High impact violence, blood and gore. The Australian distributors felt that a lower rating was a possibility, and appealed to the Classification Review Board for an MA15+ (15A in UK terms). A five-member panel of the Classification Review Board has unanimously determined that the film, Hellboy, is classified R 18+ (Restricted) with the consumer advice High impact violence, blood and gore. In the Classification Review Board's opinion Hellboy warrants an R 18+ classification because the violence has a high impact. The overall impact of the classifiable elements in the film was high. It is the view of the Classification Review Board that the fantasy context does not mitigate the cumulative impact of the violence on a more vulnerable audience. The Australian Government have announced the introduction of a new bill aimed at imposing criminal liability on executives of social media platforms if they fail to remove abhorrent violent content. The hastily drafted legislation could have serious unintended consequences for human rights in Australia. Poorly designed criminal intermediary liability rules are not the right approach here, which the Government would know if it had taken the time to consult properly. It's simply wrong to assume that an amendment to the criminal code is going to solve the wider issue of content moderation on the internet, said Digital Rights Watch Chair, Tim Singleton Norton. Regulating online speech in a few days is a tremendous mistake. Rather than pushing through reactionary proposals that make for good talking points, the Australian government and members of Parliament should invest in a measured, paced participatory reflection carefully aimed at achieving their legitimate public policy goals. The reality here is that there is no easy way to stop people from uploading or sharing links to videos of harmful content. No magic algorithm exists that can distinguish a violent massacre from videos of police brutality. The draft legislation creates a great deal of uncertainty that can only be dealt with by introducing measures that may harm important documentation of hateful conduct. In the past, measures like these have worked to harm, rather than protect, the interests of marginalised and vulnerable communities, said Mr. Singleton Norton. This knee-jerk reaction will not make us safer or address the way that hatred circulates and grows in our society. We need to face up to the cause of this behaviour, and not look for quick fixes and authoritarian approaches to legislating over it, he concluded.